Our installers are trained professionals. So you picked the perfect window film for your beautiful home, what happens next? The installer will clean the glass with a solution to remove any particles from the glass. The solution is cleared off with a special scraper. Once the glass is free of debris, the release liner is removed from the film and the glass and film is sprayed with a slip solution which allows the installer to position the film. 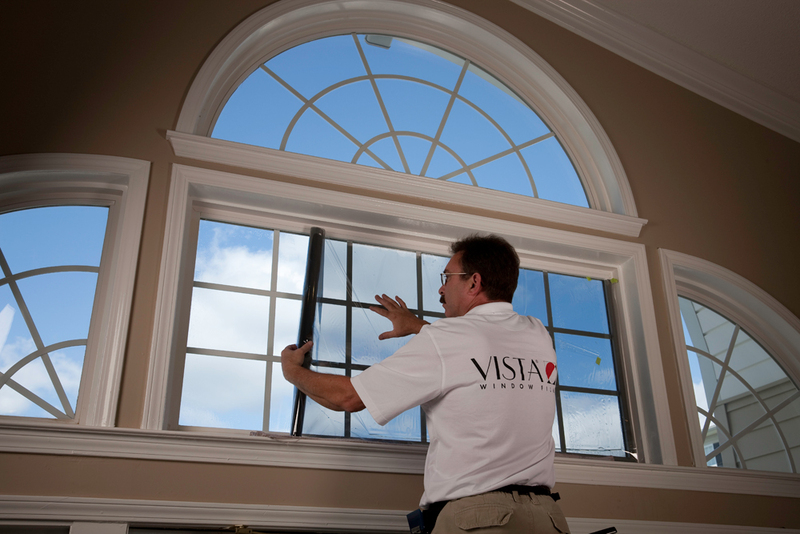 Once the film is positioned, the installer uses a squeegee to remove the excess solution and the film is then trimmed close (1/16 to 1/8”) from the windows edge. Sometimes this gap is noticeable when using darker films. Once installed, you may see small bubbles in your film due to the solution being trapped between the film and glass. The bubbles will disappear once the film starts to dry (cure). The curing time allows the films adhesive to bond to the glass. The amount of time depends on the windows location, type of film used, and weather. For example, windows with direct sunlight (Western/Southern exposure) will dry faster. Allow 30 days before cleaning your windows. After that, you can use window cleaning products or a solution of water and a few drops of dishwashing detergent (such as Dawn). Do not use paper towels, many are rough and may scratch the film. Micro-fiber cloths and rubber squeegees are recommended. Window film, when properly taken care of, lasts a long time. Many film manufacturer’s offer lifetime warranties on their products.